Gulftainer, the largest privately owned independent port operator, has marked the maiden call of the CMA CGM Virginia vessel with a capacity of 5,095 twenty-foot equivalent units (TEU) at its flagship Khorfakkan Container Terminal (KCT). The vessel call was completed in a record 5.6 hours, approximately 8.4 hours ahead of schedule. CMA CGM, a leading worldwide shipping group, currently operates a diversified fleet of 445 vessels with a combined capacity of over two million TEU. CMA CGM has announced the launch starting July 2 of its new service between the East Mediterrane an, Djibouti, Arabian Gulf, Pakistan and India. The service is one of the fastest between these strategic zones and connects CMA CGM hubs in the Mediterranean and the Arabian Gulf. INDIAMED will complement our MEGEM (East Mediterranean to/from Middle East) and MEDEX (West Mediterranean to/from Middle East & Indian Sub-Continent) offering synergies between services to allow an improved port coverage of these areas and better connections. ZIM has announced the restructuring and upgrading of its services in the East Mediterranean. The new structure offers extended coverage of East Mediterranean ports with excellent transit time. 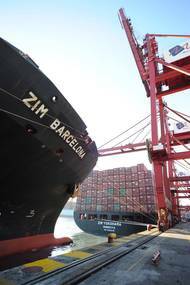 ZIM is adding the ports of Aliaga (Turkey ), Damietta (Egypt), Iskenderun (Turkey) and Ashdod (Israel) to its schedule. The newly introduced Thessaloniki to Damietta link will cater for the growing reefer trade on this route, offering a fast transit time and fixed window in Damietta. The shipping industry saw its safest year in a decade in 2015, according to a new report from Allianz Global Corporate & Specialty (AGCS), though 85 total losses reported worldwide last year, down from 88 in 2014 and well below the 10-year average of 123. Although the number of losses remained stable year-on-year, declining by just 3% compared with the previous year (88), 2015 was the safest year in shipping for a decade. Losses have declined by 45% since 2006, driven by an increasingly robust safety environment and self-regulation. However, disparities by region and vessel-type remain. CMA CGM strengthens its historical presence on the Mediterranean market by connecting France, Spain, Turkey, Lebanon, Egypt, Malta and Algeria direct. CMA CGM offers a direct connection between East Med and West Med. CMA CGM has announced the launch of the first Group’s service dedicated to intra Mediterranean trades. The WEMED service (West Med – East Med) was launched on March 11th 2016 and offers the Group’s clients direct transport solutions to Eastern Mediterranean countries (France, Spain, Algeria) and Western Mediterranean countries (Turkey, Lebanon, Egypt). NewLead Holdings Ltd.announced today a review of the commercial competency of one of its bitumen tanker vessels, the MT Sofia since the vessel was delivered to NewLead's fleet. The Sofia is a 2008-built bitumen tanker vessel of 2,888 dwt and is one of the five bitumen tanker vessels that were delivered to NewLead's fleet during the fourth quarter of 2014. Since the end of November 2014, when NewLead took delivery of the Sofia, the vessel has been trading in the spot market under consecutive voyages. Global fixture activity for suezmax crude tankers rose in the first quarter by 5% year on year, with most of the activity coming out of West Africa. Suezmax fixtures out of the Caribbean rose by 48%, most of which headed to the US Gulf and East coast Panama. During the first quarter 2015, there was a 45% rise in suezmax fixtures from the Middle East Gulf (MEG) to West Coast India, compared to the same period last year, according to new research from New York-based marine transportation consultancy McQuilling Services. According to the U.S. Energy Information Agency, one of the world’s oil transit choke-points is the Suez Canal, the Panama Canal being another. However, the recently announced Suez Canal expansion plans are more likely to cater for containership transits, in strong competition with the expanding Panama Canal, rather than respond to the demand from oil tanker transits. On Tuesday, August 5, 2014, the Egyptian President Abdel Fattah el-Sisi unveiled the project, which is bound to be a multiyear, multibillion dollar one. The recently published annual review of trends and developments in shipping losses and safety – 'Allianz Global Corporate & Specialty Safety and Shipping Review' – indicates that world-wide ship losses declined by 20% compared with 2012. With more than 90% of global trade estimated to be carried by sea, the safety of international shipping vessels and routes is critical to the health of the global economy. During 2013 there were 94 losses reported worldwide, ensuring the annual total dropped under 100 for only the second time in 12 years, continuing the recent downward trend.